The world was pretty shook over Justin Bieber and JoJo Siwa‘s Twitter feud last month, especially because the two stars may be the most random pairing in Hollywood. But right when we thought the drama was over and things were finally all good between them, Justin totally shaded the “D.R.E.A.M.” singer again! Uh-oh! Taking to his Instagram Story, the 24-year-old posted a pic of JoJo’s book — JoJo’s Guide To Making Your Own Fun — and wrote, “Burn it.” Oh snap. But don’t worry guys, Justin was totally just joking because he added, “Haha JK.” Phew. And JoJo’s response to Justin’s comment was perfect. The 15-year-old took to her own Instagram, where she posted a snap of herself reading her newest book to a life-size JB cutout. “Since @justinbieber likes my books now I thought I would read him my new one,” she captioned it. 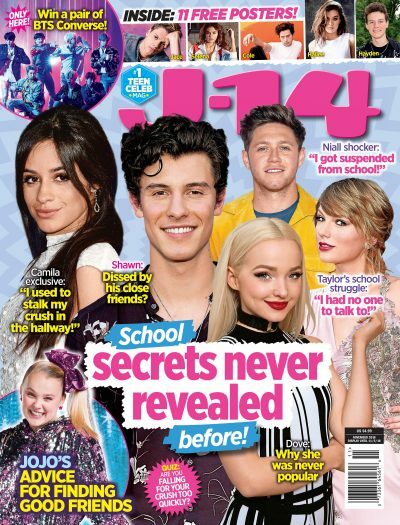 As J-14 readers know, the pair’s original feud started after the “Love Yourself” singer commented on an Instagram post urging the Nickelodeon star to burn her new car. The vehicle had JoJo’s face pained all over it, and for some reason Justin was not a fan. “It’s all good bro! You can perform at my 16th birthday party and we’ll call it good!” JoJo fired back. She even posted a pic of herself in the car next to a cutout of the 24-year-old, which of course, she captioned, “Burn it.” LOL. It seems like the comment has become somewhat of an inside joke between the stars and we are living for it.